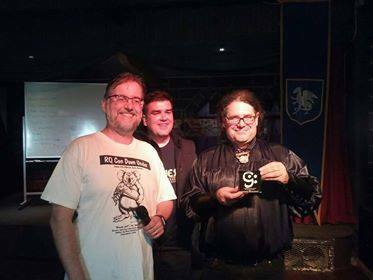 Inaugural Greg Stafford Memorial Award | RPG Review Cooperative, Inc.
At the close of RQ Con Down Under III this weekend, we were delighted to present Lev Lafayette with the inaugural Greg Stafford Memorial Award for Gloranthan Fandom. This is a new award, established in memory of Greg Stafford and with the blessing of his family, that Chaosium will occasionally and irregularly give out to recognise a *significant* and *exceptional* contribution to Gloranthan Fandom in a current year. Why did Lev receive this award? As our Australia - Asia/Pacific convention coordinator Andrew said when we presented it to Lev: "You went on a heroquest and brought RQ Con Down Under back from the otherworld. Greg would be proud." The previous RQ Con DUs were in the last century (1996 and 1998). Lev was the driving force successfully bringing RQ Con Down Under back. The event was a great success, and sufficient funds and interest were raised to want to stage it again next year. Lev's own thoughts on Greg Stafford's passing are on his personal 'blog, where he says that Glorantha is "the greatest fantasy world ever created" and that the Great Pendragon Campaign is "the most important book ever written on Arthurian legend".